An HPV-1000 in GTA San Andreas. 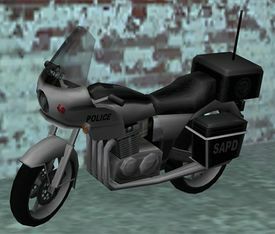 The HPV-1000 is a police motorcycle in Grand Theft Auto: San Andreas. The HPV-1000 is a police motorcycle ridden by San Andreas Police Department police bikers. It is very fast and agile (below higher end models such as the FCR-900 and NRG-500), although the player can fall off easily if they have minimal "bike skill". If the Rhino or Hunter is not yet available, this bike is a good choice for completing the Vigilante side mission - mainly because the player can fire a submachine gun straight ahead, allowing them to take out the opponent easily. Although its siren is not effective in prompting oncoming vehicles to move out of the way, its compact motorcycle design allows it to navigate around traffic far better than full-sized cars. The HPV-1000 assumes a unique model that is not shared by another motorcycle, and bears resemblance to a Kawasaki KZP, the police model of the Kawasaki KZ1000. The name of the motorcycle may be a reference to the human papillomavirus (HPV). The HPV-1000 makes an important appearance in "Cop Wheels", in where protagonist Carl Johnson needs to steal four HPV-1000s in various places around Las Venturas for the heist and needs to deliver it to a moving Packer. In a prerelease screenshot of the game, "911" was written on the rear and used to display the text "POLICE" instead of "SAPD" in the final build. In another prerelease screenshot, "LSPD" was displayed on the rear of it, implying that there would be a city-specific version of each HPV-1000, rather than a state-wide version. Found patrolling the streets in the main cities in San Andreas (Los Santos, San Fierro, and Las Venturas). VCPD Wintergreen, GTA Vice City Stories equivalent. Police Bike, The Ballad of Gay Tony equivalent. This page was last modified on 24 August 2013, at 15:41.